NFL Football and sewing with family, oh the love. PJ’s for game day. 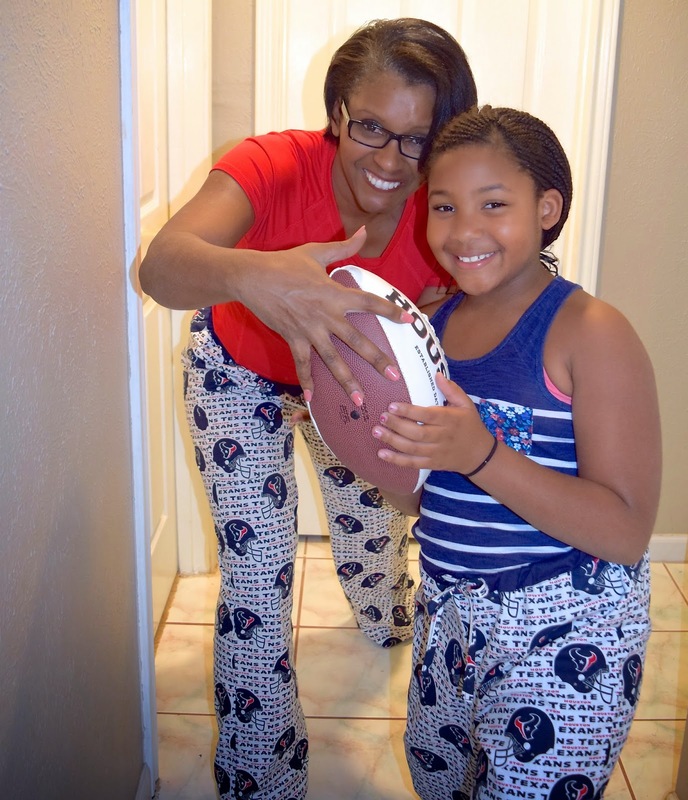 Win or lose, it’s always so much fun to watch our Texans football games with the family. Even more fun when we dress the part. These are the coolest pjs I have made. 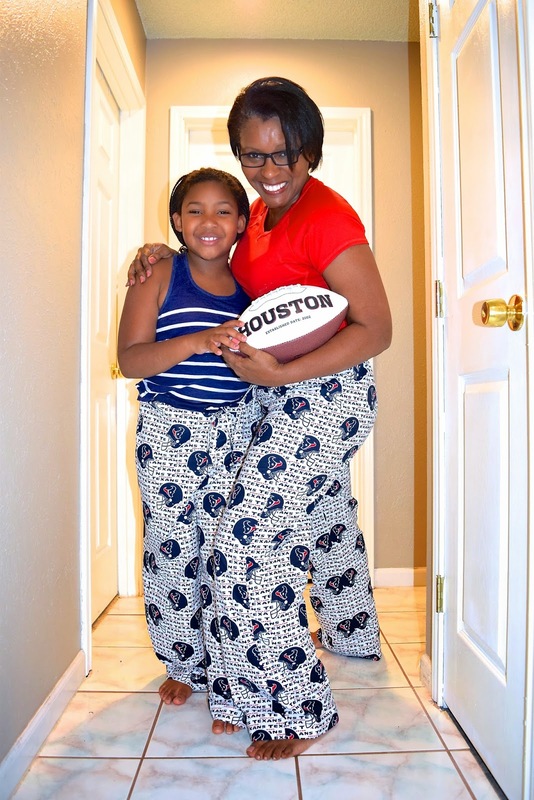 Not because they are Texans fabric, but because I get to sew and enjoy the things I love with my “Mini-me”. Man, I get so much joy from sewing with my granddaughter!! It takes me back to the days when I watched and sometimes joined in to help my mom. Though, I think then, she did most of the sewing. I made my pair using the easy Simplicity pattern 2414. It’s a pattern meant for cargo pants. But I just left off the pockets. What drew me to this pattern is that the waistband was separate and had 3 elastic channels plus buttonholes and a drawstring. 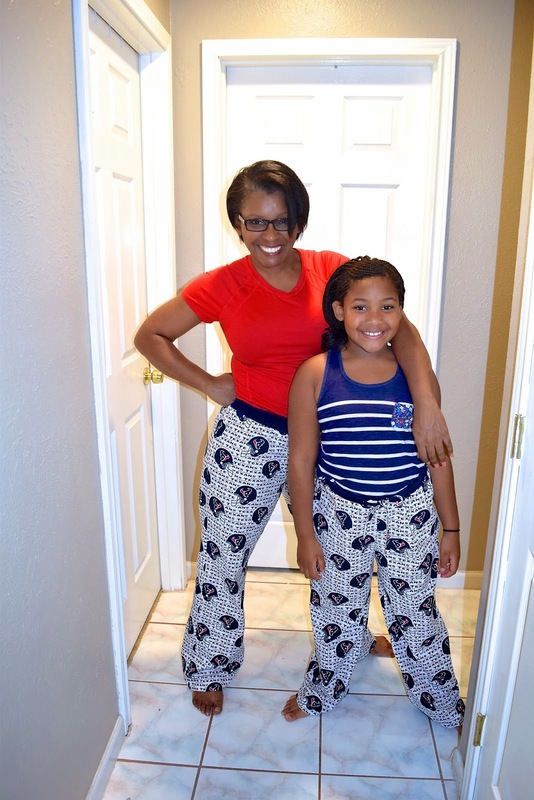 For Mini-me I self-drafted a pair from a sloper I use from my Cameo Professional pattern design software by Wild Ginger. We sewed these on the sweet, 780 sewing and embroidery computer on loan to me from the lovely folks at BerninaUSA! All the serger finishing were done on my Bernina serger (bought by me 30 years ago!!). The eye cover is copied from another pair I had. The sweet detail about them is the nose guard that helps keep the light out. These are the lounger/pants my students sew in my beginner sewing classes. They are roomy and very comfortable. Make yourself a pair. (I almost sound like a commercial. 😇. That’s pattern reviews for you. Catch me at the game next week, I’m confident our boys will do better. Saints and Dallas fans need not comment! !